The FRBR-model provided by the IFLA Study group on the Functional Requirements for Bibliographic Records addresses the need for a more thorough model of bibliographic information. This paper describes a solution for applying the FRBR model to existing bibliographic catalogues. This is accomplished by augmenting the catalogue with an externally stored map that contains relationships and entities according to the model. 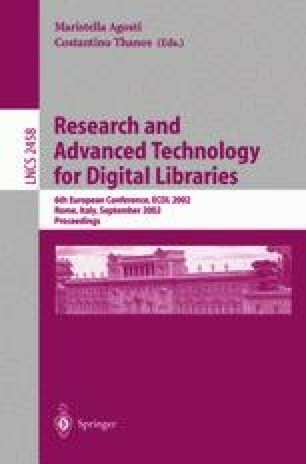 The core of the system is the Digital Library Link Service developed at the Norwegian University of Science and Technology — a flexible and general purpose link service developed to support the structuring of information objects in digital libraries. A client application is developed to visualize the map and to enable users to interact with the map by navigating along the available paths. Delsey, T. Functional Analysis of the MARC 21 Bibliographic and Holdings Format.Technical report, 2002. Prepared for the Network Development and MARC Standards Office, Library of Congress.URL: http://www.loc.gov/marc/marc-functional-analysis/home.html [last visited 2002-06-26]. Hegna, K., Murtomaa, E. Data mining MARC to Find:FRBR? Technical report, BIBSYS/HUL,2002.URL: http://folk.uio.no/knuthe/dok/frbr/datamining.pdf [last visited 2002-06-26]. IFLA study group on the functional requirements for bibliographic records. Functional Requirements for Bibliographic Records:Final Report. Technical report, IFLA,1998.URL: http://www.ifla.org/VII/s13/frbr/frbr.pdf [last visited 2002-06-26 ]. Library of Congress. Displays for Multiple Versions from MARC 21 and FRBR.Technical report, Network Development and MARC Standards Office, Library of Congress, 2002.URL: http://www.loc.gov/marc/marc-functional-analysis/multiple-versions.html [last visited 2002-06-26 ].